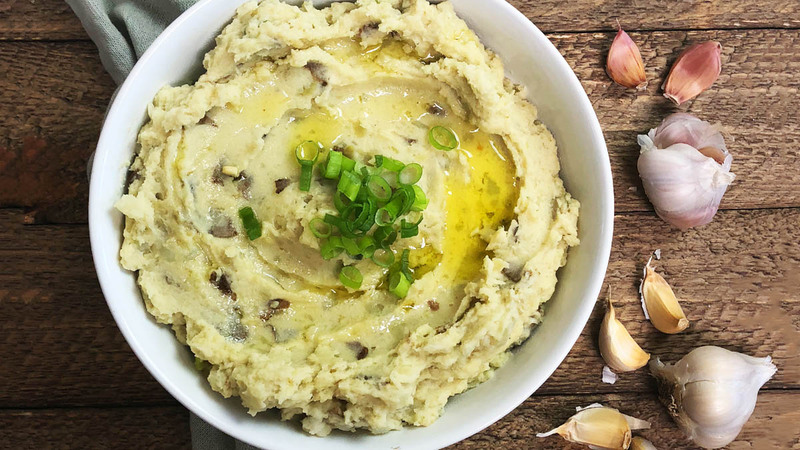 Our oh-so-delicious garlic mashed potatoes are reminiscent of the classic dish we dairy-free eaters often long for. Swapping butter and milk for homemade cashew cream and nutritional yeast, our plant-based version of a beloved staple is ready in less than an hour! 1. Soak 1 cup of cashews in 1 cup of water and let sit for at least 6 hours. 2. Rinse cashews and combine with 1 fresh cup of water, and blend on high in a blender until smooth. 3. Bring a large pot of water to a boil, adding in potatoes carefully, and boil for a minimum of 30 minutes, until a knife can cleanly be pulled in and out of a potato. 4. Once fully boiled, rinse potatoes and keep in the large pot they were boiled in. 5. Add in garlic, olive oil, salt, nutritional yeast and cashew cream, mashing until smooth. - Enjoy!